Growing up in Huntington Beach, CA., Eric Van Eimeren discovered ceramics in high school. He went on to earn a BA in ceramics at San Diego State University, and an MFA from Alfred University, N.Y. in 1990. He then moved to Helena, Montana to be a resident artist at the Archie Bray Foundation. 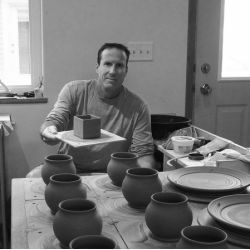 At the end of his residency in 1993, Eric set up a pottery studio, and has enjoyed living and working in Helena ever since.